Chaikin Oscillator (CHO) is oscillator developed by Marc Chaikin. It is calculated as MACD of A/D indicator. CHO calculation is based on Accumulation/Distribution indicator (A/D). For short EMA period is usually used value of 3 and for long EMA value of 10. Buying and selling signals could be generated using divergence: if price of security is falling, but value of CHO is rising (positive divergence) we could expect that soon prices will start to grow. Similar applies to up trend (when price is rising and CHO is falling, soon trend will change). Zero line crossovers are also important. They could indicate trend reversals. 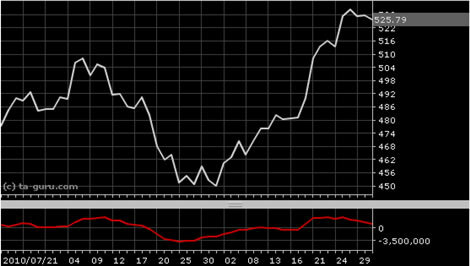 Open chart for google with Chaikin oscillator.